This dual-tipped marker set is used for cardmaking, lettering and scrapbooking. Ideal for paper crafts and stamping projects. This package contains twelve calligraphy markers, twelve writer markers, six journal and title markers, six scroll and brush markers, six brushable markers, three writer chalk pastel color markers and three calligraphy chalk pastel color markers. 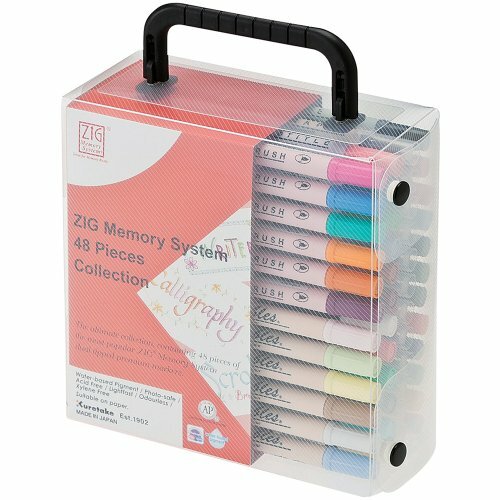 Total 48 archival quality markers. Imported and conforms to ASTM D4236 standard. If you have any questions about this product by Kuretake Zig, contact us by completing and submitting the form below. If you are looking for a specif part number, please include it with your message.